With homes and downtown buildings rising in Charlotte County, the new town of Babcock Ranch filed an application last week to expand its footprint into Lee. What could its application mean for neighbors and the region, if approved? While Lee planners and interest groups study the 398-page tome, two issues — water quality and compatibility — stand out. In the mid-2000s, Lee took a step to protect its drinking water by earmarking some lands to be only very lightly developed. The designation called DR/GR (density reduction/groundwater recharge) applies to most of Babcock’s land in Lee. It means Babcock can only have one home for every 10 acres on its 6.5-square-mile property — 434 homes. Babcock asks to change the DR/GR policy based on what the county did for developments in south Lee. In Estero, county studies concluded that clusters of development amidst preserved, open land can meet the goals of protecting water quality. The result was an envelope of opportunity for south Lee developers who agree to protect open space and restore the water quality on their DR/GR property. “We wanted to make sure only projects that offer the benefit are approved,” said Nicole Johnson of Conservancy of Southwest Florida, which embraced the approach. Pepperland Ranch wants to turn 637 DR/GR acres into a residential community of 700 homes and a 50,000-square-foot amenity center on Corkscrew Road in Estero. 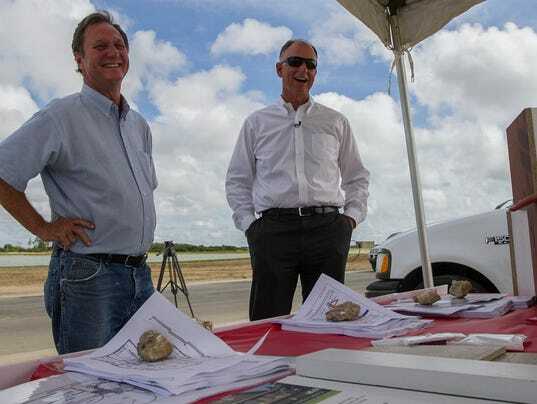 Verdana wants to turn 1,460 DR/GR acres into a mixed-use community of 1,460 dwellings and 60,000 square feet of retail on Corkscrew Road in Estero. But the county’s study doesn’t apply to lands in north Lee, Johnson says. Nor do the policies that came from it. So Babcock has used its own experts and standards to amend the county’s DR/GR policy. It’s also proposing something that’s not on the table at all in south Lee — approval for intensely commercial development on economic rather than environmental grounds if the regional benefit is great enough. The county has to decide — will it jettison its one unit-per-10-acre DR/GR policy and let developers redefine it on a project basis; or take responsibility for creating a coherent policy? Daltry thinks the county’s water protection policy, which is operating on a 10-year-old analysis, needs updating. “There is an opportunity for the county to do more as far as creating the tool to determine how hydrology could and should be restored, not only individually, but linking projects together,” Johnson suggested. Commissioner Frank Mann, whose district is the most affected by Babcock, called it “unrealistic” to say the DR/GR can never be changed. Babcock’s application is an occasion to debate the future of DR/GR lands outside south Lee. It isn’t Babcock’s first application in Lee. In 2006, the developer proposed, and withdrew, a residential enclave with about five acres of community retail and amenities. Daltry thinks the development today would be approved. This time, however, the application includes “diverse” commercial uses that depart from the area’s protected rural character; even, perhaps, from the character of Babcock itself. “What are ‘diverse’ businesses?” Alva resident Ruby Daniels asked. To some people, that makes it the most objectionable part of Babcock’s Lee plan. “Here you have an open space at the end of a two-lane road in a rural area. Is that the best place to put such a development?” Daltry echoed the general concern. The sporting events – 43 a year held over 267 days, according to Perfect Game — would draw an estimated 100,000 unique visitors to Babcock and create 1,833 jobs either working in the restaurants, hotels and shops, or cleaning them. Overall, Babcock would generate $1.1 million in bed taxes for the county, $3.2 million in general revenue, and $5.7 million for the Lee school district, its economic study says. The application provides extensive setbacks and green buffers to screen the commercial activity and set a high bar for other developers to follow. “We are going to design Perfect Game so we design and maintain the rural character,” Crespo said. A public hearing will be scheduled where people can weigh in before the county hearing examiner. The hearing could be continued over several days because of the development’s scale. The commission will vote on the hearing examiner’s recommendation in another public hearing. To speak at the hearing, you must have attended and spoken before the hearing examiner.